While Piglet is little I have full creative control over his bedroom. I can decorate it however I want to, keeping it simple and a peaceful area for him to sleep him. Like many mums (and dads!) out there I am not a fan of big garish character themed bedrooms, but on the other hand I know I will want Piglet to like his bedroom and be able to express himself in there. 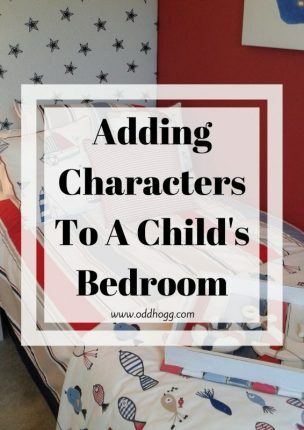 I’ve been looking at different ways to add characters to a bedroom without making it the main focus of the room, and without breaking the bank too! You can add a splash of character with a night light. These Paw Patrol ones are not only practical but also fulfil your child’s desire to have Chase near by overnight! I like to go for items that are simple to change in the future, when tastes have changed. You can get really cool Velux blinds in a Star Wars theme that they would love to see when the blinds are down. The bonus is, when they are up you can’t tell that they are character blinds at all! When I was little I had Winnie the Pooh wall stickers….. probably until I was much older than I really should have been. I still have a soft spot for Pooh now! My nephews are currently love Despicable Me, and so these Minion stickers would give them a giggle for a while but also be safe to peel away later without damaging the wall. What do you think? Do you fully embrace character bedrooms for your kids, or do you prefer to keep things low key? I’d love to hear how you incorporate characters without it being too in your face – please leave suggestions in the comment box below!